Subterranean termites are labeled by the National Pest Management Association as the most destructive termite species.The subterranean termite is the species prevalent in Western Pennsylvania. They have existed for over 55 million years and are extremely good at what they do. The hard, saw-toothed jaws of termites work like shears and are able to bite off extremely small fragments of wood, one piece at a time. Over time, they can collapse a building entirely, meaning possible financial ruin for a homeowner. Subterranean termites live in underground colonies with as many as two million members. A home can be under attack by one or multiple termite colonies at once. The foraging range of a single termite colony is difficult to predict. Small colonies may forage over only a few yards if food is plentiful. Some larger colonies may forage over areas the size of a football field. Like an ant colony, a termite colony includes a queen, workers, soldiers, and reproductives. Subterranean termites have 6 legs and range in color from milky white to light brown to a darker brown. They have 2 body segments, an oval shape, and are quite small; about 1/8 inch. Anindisputablesign of subterranean termite infestation in a home is the presence of termite shelter tubes or mud tunnels. Subterranean termites need to protect themselves from open air, so they travel either underground, or if above ground, via these mud tunnels. Essentially, they live in the soil in their colony. They come up to your home via a mud tunnel/shelter tube to feed, then travel back to their colony. These termites can eat 24 hours a day, 7 days a week. Contrary to popular belief, subterranean termites do not create “sawdust,” rather, they ingest the wood itself, feeding on cellulose. Termites do not only eat wood; they can feed on any product that contains cellulose, such as old books, damp boxes, and the like. Some homeowners experience a subterranean termite swarm. 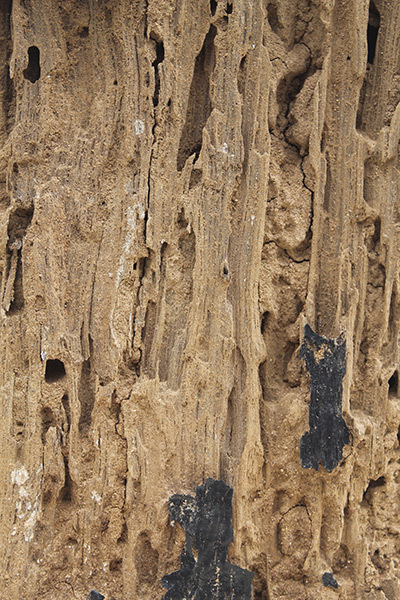 Termite swarms occur when the weather breaks from winter into spring; so March and April are typically the most active months for swarm in Western Pennsylvania. Subterranean termite swarmers are attracted to light so if they emerge indoors they will be seen flying to windowsills and open doors. A termite swarm is the reproductives of the colony flying around with the goal of creating a new colony. A termite swarmer is very small, and some may mistake it for a flying ant. Different than an ant however, is that a termite body has only 2 segments, where an ant has 3. A termite swarmer also has wings that are longer than its body and fold perfectly on top of each other. 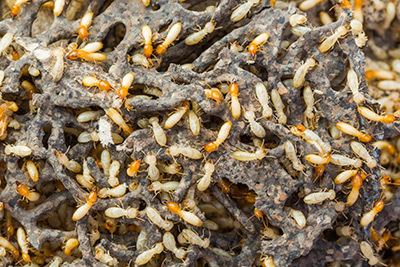 A termite swarm can include just a handful of reproductives or thousands. Thankfully, the swarmers do not damage the home. They can even occur after a treatment has been done. However, if a swarm does occur in your home, we advise calling Quality Pest Services, Inc. for a free assessment and possible estimate for treatment. Help us help you avoid a termite infestation by calling us immediately at any signs of activity, whether it be live termite workers in your mulch, a shelter tube in your basement, or a swarm of reproductives. We also recommend taking corrective measures against any conducive conditions for infestation including earth to wood contact (thick mulch, wood retaining walls, decorative railroad ties), faulty grade, improper drainage, firewood against the home, insufficient ventilation, and moisture in the basement or crawlspace. If it is determined that you have a termite infestation, or you want a preventative treatment, Quality Pest Services, Inc. offers a liquid barrier treatment. Over the years, our company has found this type of treatment to be highly effective. We use only the most top-rated termiticide materials, all according to EPA regulations and safety measures. A liquid barrier treatment involves injecting material around the entire foundation of your home. This hits the termite colony where it begins; underground. It also protects your entire home, giving you the peace of mind you need to rest easy that your biggest investment is safe. Copyright © 2015 Quality Pest Services, Inc..
Website Design by Trib Total Media and Digital HI Technology™.